We are reading a devotional by Mark Batterson, Draw The Circle in our Monday night Women’s Meeting at church. As the speaker shared from Chapter 2 “Established by God” and shared her perspectives on the chapter and how it applied to our lives, we moved in to discussion about how pottery must go through a process. It is molded and shaped, dried out, then placed in a hot kiln, and it can burst if there is too much moisture left when it is fired up. 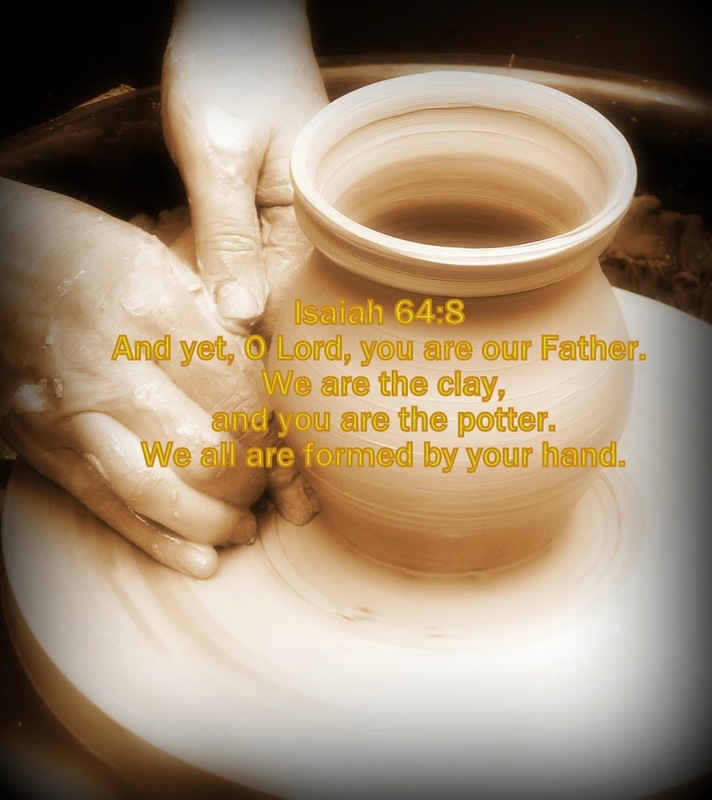 God takes us through processes much like the clay. Through our experiences, He is trying to mold us and make us into what He has purposed us to be. Often times we are resistant to the process, and He has to keep molding and shaping us. He has to keep the moisture in us so that we don’t harden our hearts in the process. When we finally submit, He has to take us through the drying out phase. Getting rid of all the flesh can be a long process. There are so many things that can impact the time frame – our physical environment is a big one. So many times we want to hold on to the ways of the world, while God is trying to get the world out of us. Then God is ready to paint our lives. He so wants to reveal His glory in our life. That is what we were made for, to magnify Him. But then, once again we have to go through the heat, to make sure that it is fused to us. I remembered making porcelain dolls at my husband’s grandmother’s doll shop. She and the other ladies that frequented the shop were amazingly talented. Grandma “walked me through” making several dolls. AKA – I picked the greenware that was already shaped into the doll I wanted. I cleaned it, sanded it, etc. She cleaned up my mistakes. She fired it in the kiln. I painted it, she again cleaned up my mistakes. She fired it again. It seems like there were several firings and painting cycles. Then she put it all together for me, and I called it the doll I made. As we had the discussion, I just kept thinking about how long the process was for ceramics from start to finish. If we are God’s masterpieces, why couldn’t we just be a painting? Paintings aren’t easy, but they are quick. You still have imperfections, but God reminded me that when I paint, I cover the imperfections. The Potter removes them. God’s work in us will last our lifetime. Even as we are fulfilling the purpose He has designed us for He will continue to work on us, in us, and through us. He will keep smoothing out the rough edges, taking us from one level to the next. He never promised it would be easy. He never promised there wouldn’t be hot times, and dry times, and lonely times. He promised He would never leave us. He promised it would be worth it, for we are God’s masterpiece. This entry was posted in Restoration and tagged Books, healing, Messages, Relationship, Scripture. Bookmark the permalink.